Ancient giants who claimed themselves gods imprinted violence, greed, slavery, debt and religion on us. They descended from self-styled “gods” who hailed from the planet Nibiru. They came to Earth for gold, got into running the planet for awhile, then most left. They and their half-breed descendants ruled Earth from 450,000 years ago and still do. They modeled obsessive and murderous competition for rule. They taught us–a race of Earth-adapted versions of them (with some copper, clay and proto-Bigfoot genes)–to obsess with rank, status, to compete, fight and even kill individually and in groups. They forced us into genocidal wars. They loosed plagues and nuclear bombs upon us. They imposed language barriers and forbade education. The Anunnaki and their spawn created exclusive and hostile religions to keep us divided. They promoted outright slavery and addicted us to credit institutions to keep us slaving more subtly. They made us serve them and the “royal” lines of ever-murderous hybrid rulers and priests–the elite–they begat. 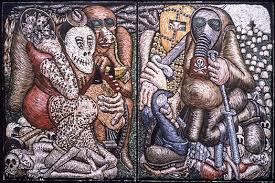 The ruling elite the gods left to govern us keep us warring with weapons and trade. The elite give all sides credit to arm and trade. They also run religions to bring back the god of their faith and defeat the gods and followers of other faiths. Our origins’ facts, widely known, can end the power of the lies of rulers to impoverish us. We see how the elite manipulate us to war. How the matrix they modeled makes us recklessly exploit our resources and pollute our environment. They see that we never feel our unity as a planet of peace. At last we see Yahweh and Allah murdered masses; they and Marduk hated women. These Nibirans lacked compassion, showed no love, certainly exhibited no divinity. We descended from the same genitors. Anunnaki gods and their hybrid overseers–the elite–imprinted on us the same greed, one-upsmanship and dominator consciousness that ran them. Everyone on Earth as family, all descended from the same ancestors from space. We can trash the master-slave-enemy mental matrix the gods scripted. We can transcend the legacy of the gods. ET terraformers seeded hominoids here a million years ago. They planned for Anunnaki, 300,000 years ago, to add proto-Bigfoot genes to the Nibiran Homo Sapien genome to make Earth-adapted humans workers. Nibirans created what the terraformers planned for us–Homo Sapien like the Nibirans, but adapted to Earth. The terraformers manipulated Nibiran goldminers on Earth to adapt their genome to Earth. [Pye, 2013]. We progressed when the ETs from Nibiru gave us advanced technologies. Every 3,600 years or so, gains ancient Iraqis,–then called Sumerians–wrote that Anunnaki gods gave them marvelous devices, astronomical and geological information, new crops, new chemistry and ever-more lethal weapons. Suddenly, our architecture, public projects, military training rev up and we build new cities and temples. 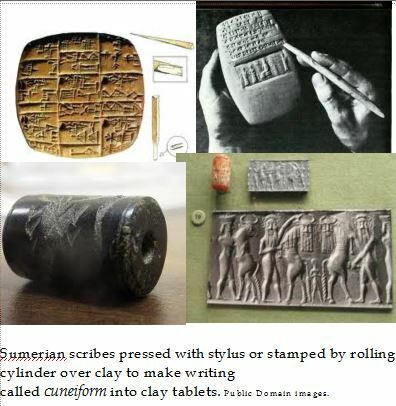 Ancient Sumerians didn’t imagine gods who taught them writing and told them what to write. Rather than imagine gods, Sumerians saw, heard and even touched Anunnaki as people like them, though bigger and longer-lived. Sumerians watched the giants run advanced machines. They witnessed gods shooting weapons of mass destruction. In Sumer, then all over this planet, the ET gods gave our ancestors ever-advanced technologies and models so they could rule, relate, mine, store data, compute, write, build, trade and war. Gods chose their half-breeds to rule us. The gods kept breeding with our ancient grandmothers each generation. Our ancestors everywhere on Earth saw, heard and even felt Anunnaki gods. Gods were not imaginary. Nor were they gods. Power elites control Earth and collaborate to perpetuate competition and war. Gardiner traced their heritage to the Nibirans who started Sumer and created the elites to rule us. These elites descended from the bloodline of Enki whom Sumerians considered a god, albeit of flesh-and blood. 300,000 years ago, Enki joined his genes with those of Bigfoot’s ancestor to breed slaves. 13,000 years ago, Enki fathered Noah, ancestor of the elite. The elite still employ a master-slave, god-worshiper code (with them in master status and we in slave–albeit economic slave–status) to run humanity. Sitchin disproved the elite’s dogma. He solved the mysteries of missing hominid links and periodic leaps in our social and industrial evolution. No missing physical links existed because we emerged suddenly, when Enki and his cohorts blended their genome and Erectus’. 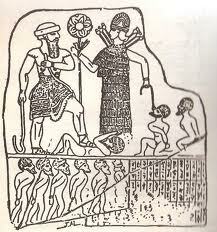 We got stronger tools and weapons when a Sumerian “gods” them to us. Our ancestors also recorded the history, scientific words and concepts the gods taught them. What gods called “MEs” we call computer programs. Our cultures added descriptions, metaphors, similes and analogies to the words the gods gave us. We can now decode our ancestors’ metaphors for the Anunnaki and their technology instead of dismissing the weapons, vehicles and personalities of gods as superstitious myths. 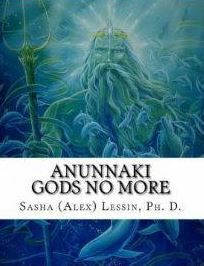 This series, Anunnaki: Gods No More, review our ancient history and sense of who we are, how we got here, and how the new paradigm of our genetics frees us from the master-slave, god-devotee, boss-worker, lord-tenant model the ETs imposed on us. The new view frees us of the physical and economic slavery, hierarchic obsession, derogation of women, gold lust, antagonistic religions and nations the Nibirans and the hybrid elite they created dictated. Ninmah, daughter of Anu, half sister of Enli and Enki, co-creator of human beings, bore the first Homo Sapien in her womb. She is our Mother. She discovered the secret to creating intelligent hybrids, cross breeding Anunnaki and Homo Erectus, and interjecting intelligence and the ability to speak. Her nephew, further enhanced humans and allowed humans to pro-create on their own by DNA manipulation using additional DNA (the rib) extracted from Ninmah. We are her children. She is our creator Mother, geneticist, genius. After Noah’s flood she promised we would never suffer such massive destruction again. Ninmah is our Mother. She loves us and is returning again to herald humanity into the new, golden Age of Aquarius, the Age of Enlightenment. There’s no cross talk, no speaking over one another. Even though many thoughts and ideas are simultaneously being communicated all around the auditorium, each conversation occurs in its own time and is understood completely by all parties talking then easily the conversation is moved to the next party until all ideas, thoughts and considerations are addressed. On the dias are three beings, all spotlighted same as I am. They appear to be sentient, bipedal forms of what appear to be large pig-like beings. But these pigs are highly intelligent, walk on two feet, stand upright and have dexterous hands, extremely coordinated. And they aren’t quite pigs. They just resemble them and I can’t explain how they look otherwise. Since we were outside of time and space the gathering lasted hours, weeks, years on some level but only seconds transpired on others. I remained in my bed sleeping, my form totally aware that I was both on Earth sleeping as Janet and at the conference before the masses as Janet Kira Ninmah Lessin, a name that cannot fully define nor explain the complexity of my existence. In my “Galzu” form I am Ki’Ra which is hardly a form at all, but a light being that resides 39 degrees on the right hand side of God, a being that is all, endless and formless where no sides can be had to reside at. But that’s the best way we of the GodSource level can explain to 3rd dimensional beings. It’s a joke and it’s real all at the same time and when we convey our existence to you, the best we can do between the laughter (for at that level breath is so fast it comes out as hysterical laughter). We do manage to gain control now and again and after some doing, can master communication through your system of in and out breath. But it’s so incredibly slowed down. Your level is slow. The vibratory frequence so painfully dense. We could not imagine actually being on that level. We can only send the slightest thread of our consciousness down to you, a sliver of our essence in order to touch you the best way we can. Bringing Janet to our zone, the assembly is the best option. So we shall from time to time. We train her to join with us at night and she feels the residual affects of this energy which is healing her human form. Click the link, it’ll make you think. Only problem I see here is they must have done this with several animal species as Humans are not alone in any of the traits listed. Let us look at warring with ones own species. Chimpanzees also war with other groups of chimpanzees over territory, food, or simply because they want to. They have even been noted to huddle as if planning and then spit up and attack the other group with multiple attacks from different angles and have a timing that demands planning. killing for the simple thrill of it? well the polar bear has been known to kill and leaves the carcass to rot away, showing it is programed to simply kill because it can. Of the five factions of the “Anun.nakim” (Anakim in the Bible) only two are benevolent to Earth humans. En.ki-E.Yah (now a Ra) and Nan.nar his nephew. There are more than 112 names they have taken – so do not become enslaved by a “mis-nomer”. Of the Oannes (Uan/Van) one is in allegiance with the SA.AM (one of the five factions)what we would call the “Dagon” with six mentions in the bible. One of these Oannes/Dagon was nailed to a temple wall. They range from Ursa Major (Al Kaid) to Leech constellations, with the negative Oannes camped at Chertan in Leo (these are the cannibal reptilian shape shifters – think the Pied Piper of Hamelin 1274) or one of the cannibals. The others come from Auriga. Do not run when you see the cigar and xylinder craft – the reptilian is myopic and very quick to see movement. If one of those bankers, petrol company owner, or… some others that resolve to pay a massive quantity of writers, and others to say something related to the past to deceive and disperse people, they have money to do much more than this. Forget about those ET’s … We have to keep attention on humans owners of big companies that are scheduling plans from centuries. Agenda 21 is one, Trilateral Commission, NASA Air Space, etc. We cannot “forget” about the extra terrestrials – they ARE the banksters and the elite! They are in the United Nations and they look exactly like we do. I am the Janet referred to in this diatribe and there are many good points here that I’d like to address. First of all I am not the only one who channels Ninmah. She is not limited to being in one body. She is now further evolved than she was when last we heard from her (as are we all). We are all learning, growing, evolving and becoming conscious each passing moment.